"Shirataki" redirects here. For the village, see Shirataki, Hokkaido. Shirataki (白滝?, often written with the hiragana しらたき) are thin, translucent, gelatinous traditional Japanese noodles made from the konjac yam (devil's tongue yam or elephant yam). The word "shirataki" means "white waterfall", describing the appearance of these noodles. Largely composed of water and glucomannan, a water-soluble dietary fiber, they are very low in digestible carbohydrates and calories, and have little flavor of their own. Shirataki noodles can be found both in dry and soft "wet" forms in Asian markets and some supermarkets. When purchased wet, they are packaged in liquid. They normally have a shelf life of up to one year. Some brands may require rinsing or par-boiling as the water they are packaged in has an odor that may be unpleasant to those not accustomed to it. Alternatively, the noodles can be drained and dry roasted. This gets rid of the bitterness. It also makes the noodles have a more pasta-like consistency. Dry roasting is done by placing noodles in a non-stick skillet on high for a minute or until you hear a slight squeaking noise when moving them around. After that they are ready to be added to soup stock or have a sauce added to them. 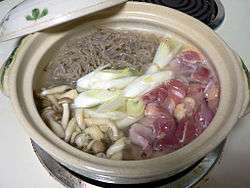 Shirataki also goes by the names "ito konnyaku", yam noodles, and devil's tongue noodles. ↑ Hui, Yiu. "Handbook of food science, technology, and engineering, Volume 4." CRC Press: 2006. p. 157-11. ↑ "Shirataki Noodle Recipes: The No-Carb Pasta". September 28, 2012. Retrieved August 28, 2016. ↑ "Why My Fridge Is Never Without Shirataki Noodles (and Yours Shouldn't be Either)". February 18, 2015. Retrieved August 28, 2016. ↑ About.com Shirataki Site About.com's information about shirataki noodles, how they are made and where to get them. ↑ Hui, Yiu. "Handbook of food science, technology, and engineering, Volume 4." CRC Press: 2006. p. 157-12.